Although National Advocacy Month has come to a close, student advocacy remains a relevant and vital topic to discuss. Just like other programs and initiatives set by the AIAS National Office, the organization’s commitment to advocacy must be brought to our chapters, where the general membership can spread information to schools and beyond to strengthen our impact. After all, the chapter level is where we live and work, and if we all would advocate together, our collective voice could be tremendously loud, and the positive effect we could have would be almost limitless. At AIAS Kent, we are deeply passionate about advocacy. To give our members a voice and agency within our college and the profession, we formed the AIAS Kent Advocacy Committee. Through this committee, we are providing ourselves with a body that we can utilize to speak on behalf of the students, and we have also begun several initiatives to inform our students about issues within the world of design and expose them to the realities of the profession. Many of these opportunities also offer more tangible benefits and help them advance their careers. Although our events take many forms, they most often tend to be panel discussions, because we have found that format to be most efficient at disseminating a lot of information and opinions to a large group. Of all our programming, our advocacy events are often the best-attended. As it turns out, people care about advocacy; all we have had to do is provide an outlet for their passion. One of our members’ favorite events has been our Internship Panel. The Advocacy Committee held this event to provide an opportunity for our students to learn more about the hiring process and explain the advantages of securing internships. 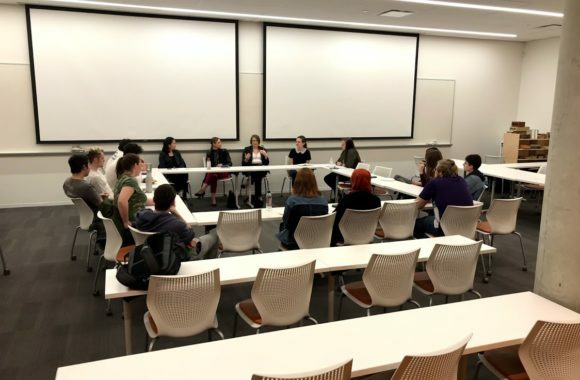 To ensure a range of perspectives, the panel consisted of two young architects, a more experienced professional in a position to hire interns, and a Kent State career advisor. During the first half of the discussion, the panel responded to prepared questions, while the second half was reserved for audience questions. Looking back, the most important thing we learned while preparing for this event was to always request more than you think you will need, to allow yourself greater choice and flexibility in choosing whatever you had asked for. For instance, rather than asking for exactly three panelists, we invited local AIA Chapters to share a list of volunteers and chose several who could accommodate our schedule. And of course, we provided plenty of pizza. Another event the Advocacy Committee puts on is a Women in Architecture Roundtable to discuss the presence of women in the profession. Our hope has been that it educates our members by highlighting important topics of equity, diversity, and representation within the profession, and ultimately inspires them to affect positive change. This event typically requires a little more planning than the Internship Panel. 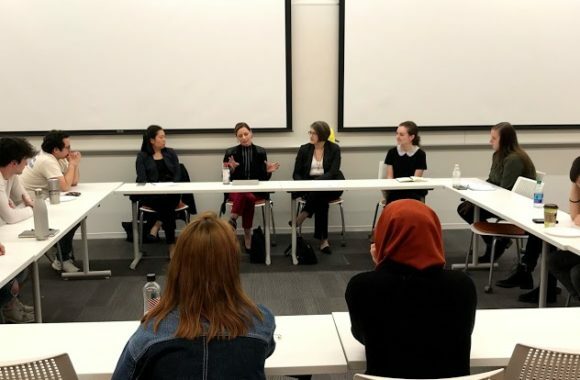 We invite a diverse group of female architects and educators to participate in the discussion, and we have a female AIAS Kent board member moderate the events. 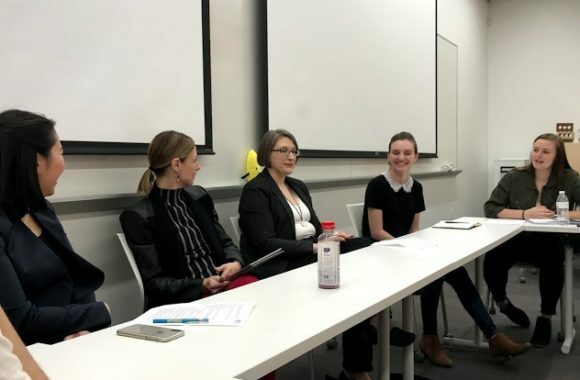 This year, we reached out to women in a variety of positions and career stages within the professional and academic spheres and curated an incredibly strong panel, including Jodi van der Wiel, the President-Elect of AIA Cleveland, Utako Tanebe, a recently licensed architect beginning her professional career, Robyn Wolfe, the Women in Architecture Director with AIA Cleveland, and Lindsey Reynolds, our 2018-19 Chapter President. The Advocacy Committee had prepared some general discussion-starters in advance, but we tried to avoid any hyper-specific questions to let the event be conversational and organic. We also left time in the end for the audience to address any additional topics they felt were important and hadn’t been brought up. And again, we provided plenty of pizza. This year, for Advocacy Month, AIAS Kent unveiled a new page on our website documenting information and resources for anyone interested in learning more about our advocacy initiatives. A key feature of this page is a section where our members can post on advocacy topics that they are passionate about. This provides them with a visible platform for advocacy and ensures that we use our voice as an organization to promote their good work. The new page also includes an anonymous submission box for students to leave suggestions and/or complaints so that we can advocate for meaningful change and offer our members a greater role in shaping the collective Kent State experience. Through our Advocacy Committee at AIAS Kent, we have seen first-hand that chapter advocacy committees are enormously beneficial and create a host of new opportunities that would not otherwise exist. The presence of an advocacy committee attracts sponsors because it fulfills their desire to contribute to advocacy-driven causes. Moreover, it opens up new partnerships with other similar causes and organizations. 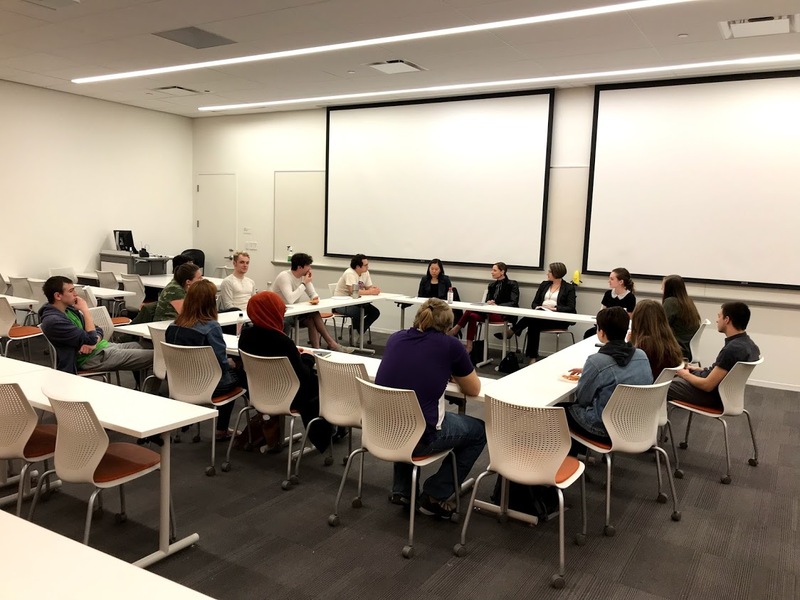 For example, AIAS Kent collaborates with the Kent State NOMAS chapter to promote equity and diversity, sharing both the burden of planning and the satisfaction of an impactful event. Additionally, a committee like ours dedicates itself to providing specific programming, redirecting any extra pressure on the executive board, while still ensuring the continual promotion of our members’ interests. 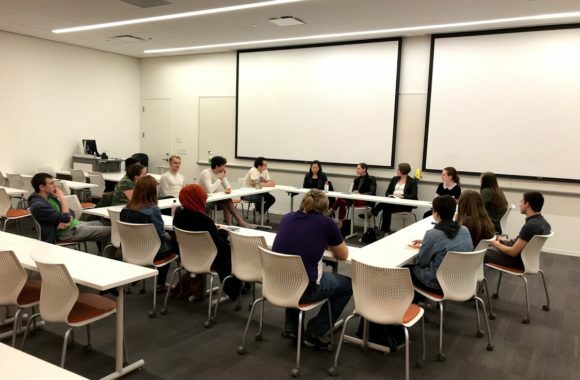 Chapter leaders at AIAS Kent value our role within a national student organization and consider it our responsibility to lend our voice to people and groups whose messages must be heard. What started as a way for us to promote the interests of students within our college has evolved into an amazing outlet for passionate people to vocalize their concerns and encourage change. We have learned through our endeavors with this committee that people want to be involved with and contribute to causes that are committed to advocacy. Our Advocacy Committee is just one of the many ways in which we strive to make the most of our agency as a chapter, and we truly believe in the power of every AIAS chapter and member to have a lasting impact. Ultimately, our hope is to serve as a model for our peers who want to push actionable student advocacy at their own schools and empower them to influence their communities.